Find obscure parts easily. Reduce error & part returns. Improve CSI. Pentana Solutions offers a real-time, integrated online parts catalogue that has been developed in partnership with our customers, taking advantage of decades of industry experience. That experience has afforded us the ability to reduce the number of vehicle off-road days your customers experience and ultimately improve your current CSI. Pentana Solutions’ Electronic Parts Catalogue has helped countless businesses deliver profit maximising results. How? By supplying the correct part in the shortest possible time-frame the online EPC ultimately ensures repeat business and reduced overall costs for your business. Pentana Solutions’ Electronic Parts Catalogue is the tool you need to order the correct part the first time, and make delivery to the customer the right way. As you can imagine, the benefits are both monetary and intangible, by turning over work faster and keeping your staff and customers less frustrated, you have the power to transform your business processes. 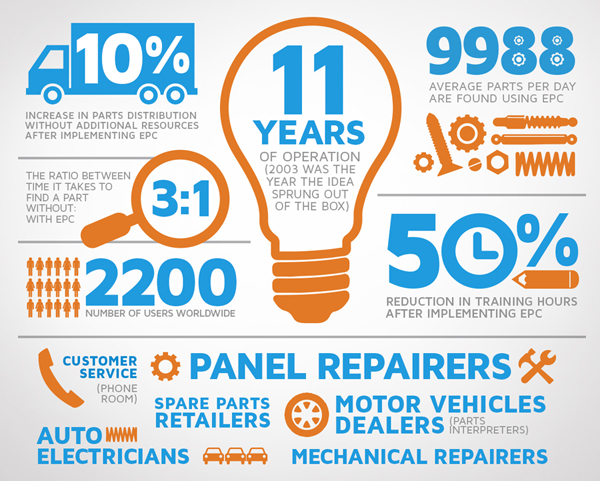 What is the key to our online Electronic Parts Catalogue? The key to our EPC lies in its integration; as the way it integrates to the rest of the dealership takes the process to the next level. The Electronic Parts Catalogue can be deployed electronically over the internet and can automatically order and deliver the correct part without any manual keying. Updates of parts information, stock availability and pricing are available in real-time; meaning you always have the correct information to prevent part returns, wasted time and disgruntled end customers. Pentana Solutions’ online Electronic Parts Catalogue has many easy to use features that make it easy to quickly locate the needed part. Using graphics and interactive visual diagrams, you’re able to focus simply on the task at hand. Every user can customise the user interface tailored to their operations – meaning frequently used parts can be readily accessed and saved searches can be recalled for later use. The user-friendly, simple to navigate ease of the Electronic Parts Catalogue is a crucial element to streamlining your business. However, the part search can be as simple or as powerful as you want it to be. With a range of powerful search and navigation tools, you can look for a single or combination of categories of the most detailed variables. You’re able to look at parts from a high level, or drill down through the navigation tree to change individual options. Simply move the mouse pointer over a diagram and click on the area of interest to zoom in. Immediately see specifications, default quantity and related bulletins – giving you everything you need to ensure part accuracy. And if you’d like to see the complete part history, simply view a chain of graphics to retrieve the information you need, and then print with associated details for sharing or later use. Through industry experience and customer feedback, we’ve developed an online Electronic Parts Catalogue that can truly revolutionise the parts aspect of your business. Call us today to find out more.